Bommaghatta is a simple village in Bellary District of Karnataka, which is frequented by many followers of Sri Madwa philosophy. Many heads of the Sri Madwa mutts also visit this holy place. The Hanuman temple of this village is the main attraction for all. The Hanuman of this kshetra is known as Hulikunteraya. The Mukya Prana Devaru [Hanuman] of this kshetra was reinstalled by HH Sri Vyasaraja. The main festival is rathotsava [chariot] for Sri Hanuman of this kshetra. Once when a shepherded was gracing his cows in the forest area near to the village, saw a strange and good looking cow in the gracing field. When the shepherded was to go back along with his cows, the strange looking cow also joined the herd. Next morning when he milked the cows, to his astonishment the milk of the new cow was so very good and tasty, next only to the nectar. He was so proud of the new cow and thanked the God for the gift. The happiness was short lived once the new cow started behaving in a strange way. She will be gracing in a different field then the one the sheepherder’s cows are gracing. She will take her own time to come back and join the herd. Strangely enough she started giving low yield of milk also. The shepherded was taken by surprise when he noticed that cow goes to a particular spot off the field near a bush and stands there for quite a long time before joining the herd. As the days went the yield of the milk from the new cow was so low, that the shepherded got irritated. To lose the milk which was like nectar made the man mad. The shepherded lost his cool one day and had hit the cow with his stick, knowing pretty well that he is not suppose to hit a cow, moment after he had hit he realised that he had made a mistake. To his surprise he saw a divine light in the cow, which made him even more nervous since he had committed a sin that to the divine cow. On the same night in his dream Sri Prana Devaru appeared before him and told him that it is leela through the cow. He had ordained the shepherded to go to the very spot where the cow was milking every day near the bush and look for him there. Next day morning when before the assembly of the elders of the village the shepherded told the entire episode of what had happened and also about the divine direction of the Sri Prana Devaru. All the village elders were taken by surprise about this and were also happy that Sri Prana Devaru had wished to come to the village. All of them went to the spot where the holy cow used to stray for hours and stay near the bush. Slowly the village men started removing the bush with all care. To the surprise of the villagers they saw a shila of Sri Prana Devaru. Sri Prana Devaru was seen with the raised right hand as if giving blow to the ravanathis and at the same time it is seen giving blessings to all His devotees. His raised langoola bestows on us courage and vigour. Sri Prana Devaru is holding gadha like Bhima. His tuft is seen like that of HH Sri Madwacharya. On the top of the shila is a inscription of Surya and Chandra indicating the link with Sri Janamejaya. A rakshasa representing evil force is seen crushed under His noble feet. It was felt by the village elders that the moorthy which was in worship, had been out of sight for the reason better known to Sri Prana Devaru. It was decided to place the moorthy in a proper place in the village and start the discontinued poojas as per the laid rules. Next day morning the villagers decided to take the moorthy to the village and make pratistapana. They had made a chariot for taking the moorthy in procession to the village. They placed the moorthy decorated with flowers on the chariot and started pulling the chariot. But the chariot stopped moving after about five hundred feet. Their efforts to move the chariot proved futile. On the same night one of the village elders was given a divine direction to the effect that the moorthy should be installed in the same place where the chariot had stopped. Accordingly the Sri Prana Devaru moorthy was kept in the very same spot and the regular poojas were conducted by Huliappan. Since the swayam vyektha moorthy of Sri Prana Devaru was found in the bushes of the plant name 'Hooli podhe', Sri Prana Devaru of the kshetra is known as Sri Hulikuntesha swamy (Sri Hulikunteraya). HH Sri Vyasaraja who had visited this village, was told about the Sri Prana Devaru moorthy. HH decided to stay for the Chaturmasya vritha in the village and made prana pratistapana of Sri Mukya Prana and a garbhagraha was also constructed. Then on the regular poojas were conducted for Sri Mukya Prana installed by HH Sri Vyasaraja. In the east of the temple the villagers wanted to build a tank for holy water [pushkarani] for Sri Prana Devaru. Once they started digging the land for the tank they found some treasure there and with that money they built the pushkarani. While HH Vadiraja was on a pilgrimage to this kshetra found a rudra moorthy in the pushkarani [holy tank] of the temple. HH Sri Vadiraja had installed the moorthy on the bank of the tank and named it Sri Gangadhara. 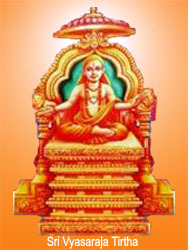 In the year 1807 Sri Subodhendra Theertharu dissentant of Sri Raghavendra Swamy did the pratistapana of Sri Seetha Lakshmana Hanuman Garuda presided by Sri Rama Devaru. It is said that these moorthys were given by Nanjangodu Sri Rama Sastri. Sri Sushameendra Theertharu of Sri Sri Raghavendra mutt had made pratistapana of navagrahas in the temple. Dewan Puriya when visited this place had made many contributions towards the improvement of the temple. Gopuram with dasavathara vigrahams is one of his main contributions. Many heads of the mutts who are following the principles of Sri Madwacharya had visited this holy shrine adds only indicate the glory of Sri Hulikunteswamy [Sri Prana Devaru/Hanuman] of this kshetra. It will be an experience to visit this holy place with all reverence stay in this holy place and see and enjoy the benevolence of the lord Sri Hulikunteraya alias Sri Prana Devaru [Hanuman].